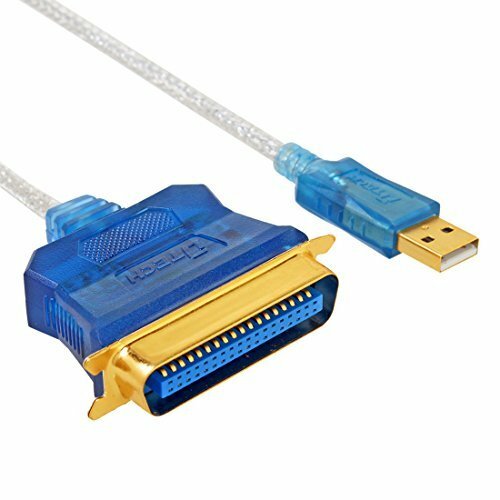 With this printer cable, you can still use your older parallel printers with your newer computer, eliminating the need for costly and time-consuming equipment upgrades. It converts a printer's 36-pin parallel port for use with a USB port on a Desktop or Laptop Computer. The USB interface provides a much faster data transfer rate than a standard parallel port, thereby reducing the time waiting for a print job to be sent to your printer. If you have multiple printers, you can eliminate the need for a switch box by connecting each printer to a USB port. Important Note: This cord is only compatible with 36-pin parallel ports. There is 25 pin and 36 pin parallel port so please check the pins of your printer before you order. Somehow windows 10 is not compatible with some parallel printer driver, you can find that a lot of people posted the same problem on windows website. So we do not recommend the cable if you use it on windows 10. Check with your printer manufacturer to confirm whether the printer itself supports a USB to Parallel conversion. Helpful steps for an old Okidata Pacemark 3410: Control Panel, View Devices. Add a printer The printer that I want isn't listed Add a local printer or network printer with manual settings Use an existing port, down arrow and select USB001 (Virtual printer port for USB) Windows Update, if you do not see your printer listed Select your printer and the drivers will begin to install. If you have any installation issue, please contact us anytime. You can still use an older printer with a 36-pin parallel port for the cable connection on newer computers equipped only with USB ports. Automatically negotiates hardware recognition for faster setup of your printer. Plug and Play. No driver & external power adapter needed. With stable strong chipset, it helps deliver faster data transfer rates than a standard parallel port. 10ft length, make it an easy, fast and convenient way to connect your printer. Compatible with legacy and aged printers (with CN36 Port), save money and time without consuming equipment upgrades.